Molly Bergen recently traveled to three countries to document field activities of the Central Africa Regional Program for the Environment (CARPE), a U.S. government-funded conservation program implemented by a coalition of NGOs, including WRI. After several hours of bouncing up the Congo River in a motorboat, as my travel companions and I pulled into the muddy bank of a dilapidated military checkpoint—some crumbling colonial-era buildings, a lone solar panel, rows of bamboo huts—our small skiff was dwarfed by the only other motorized vessel we’d see that day. Belching black smoke into the humid air, the barge looked like it had been cobbled together out of spare pieces of wood and scrap metal. On the top deck, a cluster of women pounded manioc in buckets next to a smoking stove. Below deck, a girl trailed a cup on a long string in the coffee-colored river below. In between, the barge was stuffed to the gills with white plastic sacks packed full of the fuel that powers much of modern Democratic Republic of Congo: charcoal. The DRC’s charcoal trade is intertwined with many of the forces shaping the lives of its 83 million citizens: tradition, opportunity, destruction, violence. To protect the country’s forest and improve the lives of those who depend on it, reforming the charcoal industry is essential. More than 2.5 billion people worldwide depend on biomass (which includes charcoal, fuelwood and animal dung) for cooking every day. 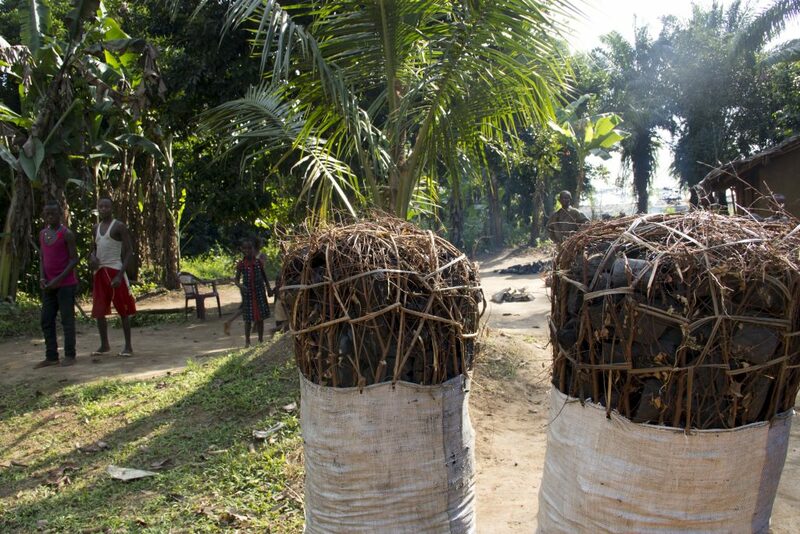 In the DRC, an estimated 90 percent of people rely on fuelwood and charcoal. Why? Simply put, it’s the result of limited energy infrastructure (only 9 percent of people in the country have electricity) and an abundance of forests. The Western Europe-sized country contains the bulk of the Earth’s second-largest intact tropical forest (after the Amazon). So far, deforestation here has been lower than rainforests in the Amazon or Indonesia; in 2000, 61 percent of the DRC was still covered in intact primary forest. However, between 2000 and 2010, more than 10,000 square kilometers (almost 4,000 square miles) of tree cover were lost—an area larger than Puerto Rico. The primary cause of forest clearing is for agriculture. After forest plots are cut and burned to make way for crops, logs are stacked in large ovens made of wood and clay, where high temperatures transform the wood into charcoal. Urban areas including the mega-city of Kinshasa, home to at least 11 million people and growing fast, are driving demand, as charcoal burns hotter than fuelwood and is easier to transport. As forests closest to Kinshasa disappear, the city’s residents must look further afield for the fuel to stoke their stoves. Rising demands have turned the country’s charcoal trade into a multimillion dollar industry—and there are plenty of people looking to cash in. Near Mbandaka, a small city almost 600 kilometers (373 miles) northeast of Kinshasa, we met a man who said he lives in Kinshasa, yet regularly comes here to personally manufacture 50 large sacks of charcoal, which he hauls by barge to Kinshasa. Even considering transportation costs, charcoal producers like him can double their profit in the capital, compared with the local market. The impacts of this growing trade are widespread. The cutting and burning of tropical forests is estimated to account for 11 percent of global greenhouse gas emissions. And as forests disappear, so will the species (such as great apes and forest elephants) that inhabit them, as well as the natural resources that millions of people depend on. 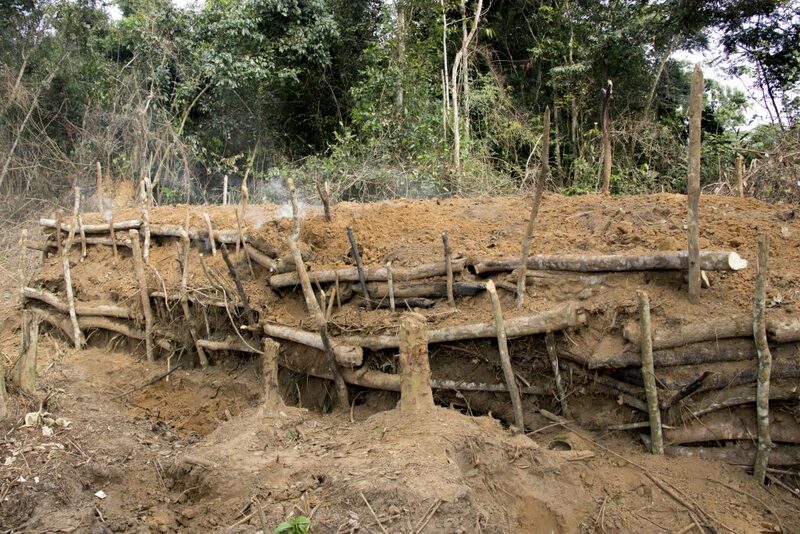 In the DRC’s conflict-ridden east, the lucrative charcoal trade has also had a more immediate impact: it’s fueling the activities of armed militia groups that have wreaked havoc on the region since the most recent civil war officially ended in 2003. In and around Virunga National Park, groups such as the Democratic Forces for the Liberation of Rwanda force charcoal producers to pay a fee to continue their activities and avoid (often violent) consequences. The desire to open up more land to charcoal production even appears to have been a factor in the killing of mountain gorillas, a critically endangered species found nowhere else in the world. A recent field survey on charcoal production conducted by the Wildlife Conservation Society in northeastern DRC found that selling charcoal provides substantial household income, allowing families to pay medical bills and school fees. However, most of the respondents said they would prefer a different livelihood. To effectively reduce forest destruction tied to the charcoal trade, efforts must tackle both ends of the problem: supply and demand. Park rangers need more resources to apprehend illegal charcoal producers on the ground. Monitoring tools such as Global Forest Watch (GFW)—an interactive online forest monitoring and alert system—and the Forest Atlas—a platform that combines GFW’s technology with nationally sourced datasets to provide more detailed information—could help by providing near real-time alerts on changes in forest cover, allowing rangers to respond more quickly to forest loss activities and active fires. In other cases, rangers know where charcoal production is happening, but don’t have the equipment to safely confront those doing it. This underscores the need for more investment in staff and equipment for targeted patrols into dangerous territory. To reduce the demand for charcoal as an energy source, the DRC government (with the support of private donors) has set up several small hydroelectric facilities in eastern DRC. While these have potential, they are currently too small-scale to make much of a dent in the national charcoal trade, and therefore other energy options are necessary. More efficient cookstoves could reduce demand. As part of the CARPE initiative, World Wildlife Fund began working with communities in eastern DRC in 2008 to produce fuel-efficient cookstoves that require less charcoal. 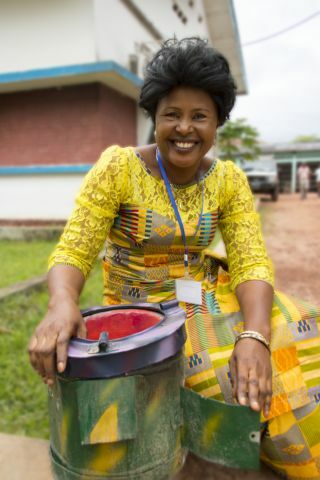 With support from CARPE and other funders, the effort produced more than 90,000 stoves in the region. By 2015, this shift reduced local charcoal needs by 17 percent, or an amount equivalent to cutting down 300 hectares (741 acres) of virgin forest. This project has since expanded to the Mbandaka region. In addition to the fuel savings, the rural communities producing the stoves are paid for their work; this new source of income gives them a small economic buffer that reduces their need to cut down more of the forest. Fuel-efficient cookstoves have also been linked to a range of other benefits for women and girls, from improved respiratory health to more time for education to reduced likelihood of sexual assault. For a complex problem like the charcoal trade, solutions are not easy, nor are the results quickly visible. But by learning from satellite data, strengthening law enforcement and amplifying the success of community-level projects, we’ll have the best chance of keeping the Congo River lined with trees far into the future.